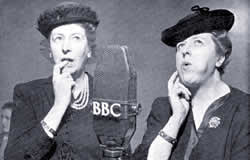 For many years these two women were among the best loved entertainers in Britain. We are sure that many of our older readers will recognise them instantly, for from they were famous from the through until the end of the 1950s. They were Elsie and Doris Waters, better known to millions as Gert and Daisy. And they had an equally famous brother – Jack Warner, much loved as TV’s Dixon of Dock Green. Throughout their careers they wrote almost all their own comic songs and sketches. TV work came late and only after they were seen in a commercial and offered their own show, a sitcom which was named after them and screened in 1959. In it they played former show business performers who ran a theatrical guest house. But it was not the success producers had hoped for, the sisters being unaccustomed to performing material written by someone else – Ted Willis, who also wrote the Dixon series. Only one series of six episodes was made.